I think we have all grown tired of face masks that do next to nothing - I know I have! As someone who has dull, blemish prone skin with enlarged pores I look for products that can help to solve all of the above problems rather than mess around with a handful of skin care treats. 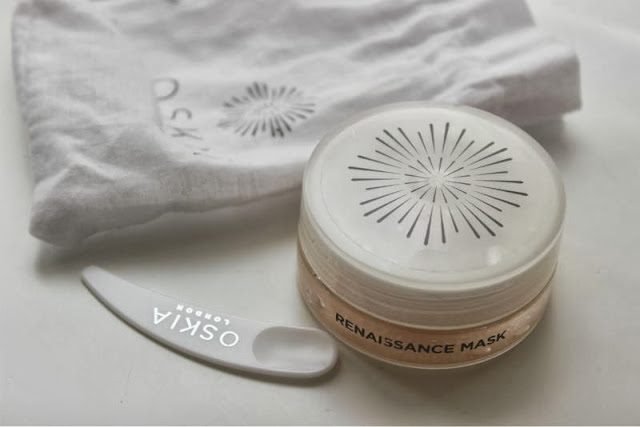 My luck was clearly in when I stumbled across Oskia Renaissance Mask which gently exfoliates the skin, conditions and contains ingredients to help deep cleanse and clear the skin too. How can I describe Oskia Renaissance Mask? It oddly reminds me of peach coloured caviare in the jar but then again I have never actually ate such delicacy so what do I know? Perhaps a sorbet is more on point and pleasing? Either way it this mask has a gritty yet jelly like consistency which feels light and cooling on the skin and is a joy to leave on the skin for the suggested 10-15 minute time frame as it does not turn sticky or tighten. Once applied it does turn slightly milky and to remove you do have to vigilant - I splashed my face around four times with water before ensuring that I removed every scrap with a warm flannel cloth. 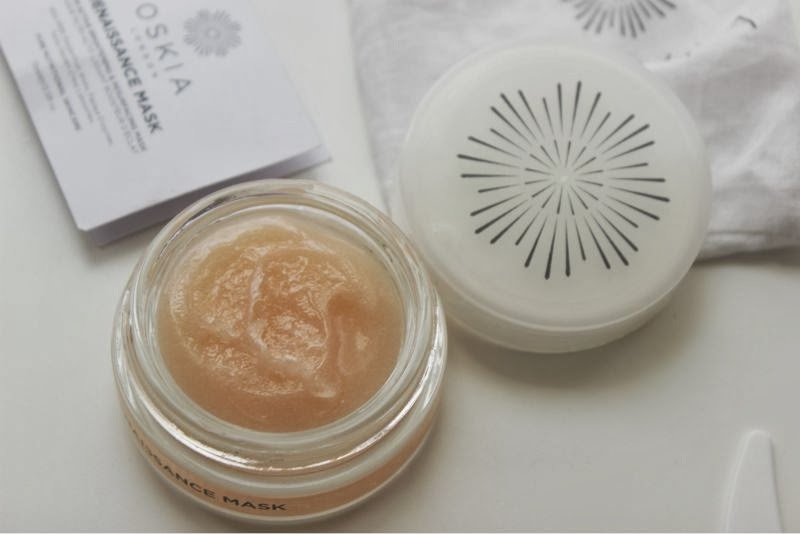 Oskia Renaissance Mask is enriched with natural Fruit Acids (AHA’s) including Passion Fruit, Lemon, Grape and Pineapple which have been included to exfoliate the skin on a molecular level. It does so by gently unbinding cells in the top layer of the epidermis to activate renewal. The mask also contains Papaya Enzymes to cleanse the skin thoroughly remove excess and tired skin cells and to clear congested pores all the while being gentle. The Renaissance Mask is also infused with Lactic Acid which reduces the appearance of fine lines and softens the skin whilst Swiss Garden Cress Liposomes leave the complexion perfectly balances, even and bright by reducing melanin production. Pretty impressive non? Like I said I want products that work instantly and that Oskia Renaissance Mask does. As soon as I removed the mask my skin was instantly brighter, felt soft to the touch yet cleansed deep down. 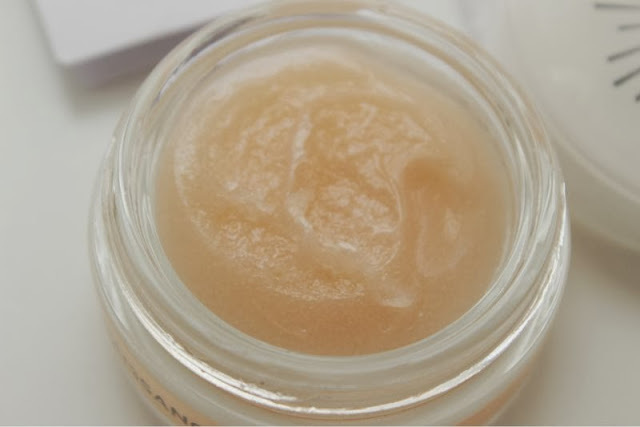 The skin has a healthy glow so much so that you will not want to wear make-up after using this and the results are on par with a professional facial. Have my pores became smaller? Nope but I have only used this three times (once a week) so there is still hope and even if it doesn't I am more than satisfied with the baby soft glowing skin. Psst shall I let you in on a secret or two? On the set of Les Misérables Anne Hathaway and a few other female co-stars who shall remain nameless all but demanded that the Oskia Renaissance Mask was used on her skin before close up's and it is said that the make stars such as Hugh Jackman and Russel Crow favoured the Oskia Micro Exfoliating Balm. I want it! My wish list on cultbeauty is ridiculously long! Haha! My best mask is pure honey. just dabbed on the face. leave it. wash it and get the fresh soft face ever. gorgeous blog and great review!